Anything calling itself “sleepy time” should be calm and relaxing, right? But there’s not much comfort to be found in the marketing of Celestial Seasonings’ Sleepytime tea. By including the Non-GMO Project butterfly logo on the product’s packaging, the company confuses consumers into thinking the tea is different from others on the shelf. But here’s the truth: with only chamomile, spearmint, lemongrass, tilia flowers, blackberry leaves, orange blossoms, hawthorn and rosebuds as ingredients– none of which are genetically modified – there is not a GM version of this tea’s plant sources in the first place. When it comes down to it, this fearmongering label is simply deceptive – not what you’d expect from the otherwise calm and tranquil packaging. In a message to their customers, Celestial Seasonings continues the fearmongering by promising (in all caps) that they DO NOT use genetically modified ingredients. However, the vast majority of their ingredients, like those in Sleepytime tea, do not even have genetically modified versions available to consumers. 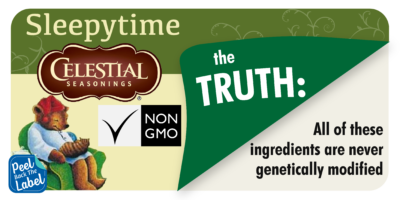 Celestial Seasonings claims to be committed to transparency and cites it as their reasoning for using a non-GMO label, but we all know better. This label isn’t there to better serve customers or provide more information; it’s there to deceptively differentiate the product from the competition in the name of profits. Instead of deceiving the consumer, Celestial Seasonings should rely on the quality of their products to make sales. If you agree, tell Celestial Seasonings through a Tweet to @CelestialTea, post on their Facebook page, or send them an e-mail.